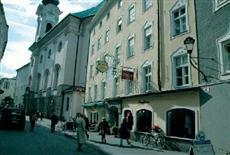 The Altstadthotel Amadeus Salzburg is located in the heart of the Old Town in Salzburg, Austria. Many world-famous points of interest are within walking distance of the hotel, including the Hohensalzburg Fortress, the Mirabell Gardens, the Salzburg Cathedral, the Mozart Museum, and the Getreidegasse. The Altstadthotel Amadeus Salzburg is located approximately five kilometers from the Salzburg airport and three kilometers from the train station. Most attractions are within walking distance from the hotel, but it is not hard to find public transportation or a taxi service. Each room in the Altstadthotel Amadeus Salzburg offers an en suite bath with a hair dryer and complimentary toiletries. Guests may avail of the direct-dial phones, cable and satellite televisions, in-room safes, and CD players. Non-smoking rooms are available, as is room service. Many amenities welcome guests to the Altstadthotel Amadeus Salzburg, such as an on-site restaurant, a café, and a rooftop garden. A complimentary breakfast buffet greets each guest in the morning. An Internet corner is available for use by all. The Sound of Music tour also offers a hotel shuttle for interested parties.